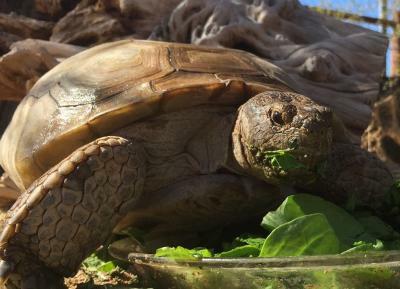 Come say hello to Santana and Shelly, our Desert Tortoise Ambassadors, as they devour their tasty green breakfast. The Ranger will talk about what they like to eat and share some of the unique personality traits and quirky behaviors of this mother-daughter dynamic duo. Then go indoors for a classroom presentation that explores the world of desert tortoises, how they survive in the wild and how we can keep them safe. This is a Wet n' Wild program where each family in attendance will have a chance to win a 4-Pack of tickets to Wet n' Wild Phoenix (a $176 value). One raffle ticket per family. Must attend entire program to be eligible. $7 per vehicle park entry fee.